I received an anonymous tip on Twitter about a mysterious sausage maker in an unlikely location. To my knowledge, the workshop is completely hidden from view and is owned and operated by an oldschool 5th generation sausage maker. The Main Street and Broadway intersection is a busy hub that’s lined with hip cafes and indie shops. It’s also where a fire destroyed five businesses last November. Somewhere among the rubble lies a passionate pair of meat craftsmen with an inspiring story to tell. It began more like a drug deal than a charcuterie tasting. Mainly Main and I met our guide in the back alley. We nodded at each other as confirmation. He led us behind a fence, down a few steps, and into the secretive workshop. Once inside the antiqued-mint-green workshop, we were greeted by a friendly giant with a firm handshake. He invited us over to a steel counter that showcased a dozen different artisinal meat products. As we sampled on his offering of liver pate, salami, headcheese, and my favourite, pork jowl prosciutto, Drews shared his admirable and tragic story behind D Original Sausage Co. The first thing I noticed when I tasted Drews’ meats is how clean and authentic they tasted. 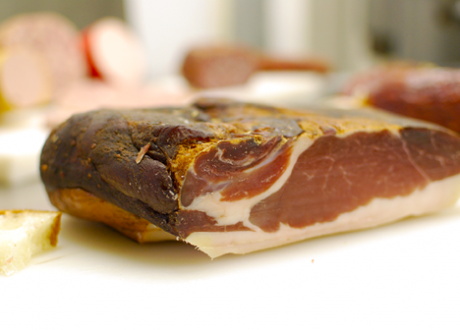 The salami tasted just as it should – comprised of little more than salt, spices, and quality meat. I was skeptical when he offered me a slice of bologna, which I haven’t had since the squishy mayo sandwich days in elementary school. But wow, it tasted nothing like the processed foam I remember. It’s a complex, grown-up version that I’d be happy to see in kids’ lunches. What makes their product stand apart from the rest? Meat selection is extremely important. Each pig is raised locally and hand-selected. Every product requires thoughtful preparation. For salami, the meat should begin frozen but the initial temperature for each product differs. Moisture is naturally removed during the freezing process which also destroys the cell structure. If the meat starts out dryer, they can use less salt and sulfurs. This is a process that many sausage makers “don’t bother with anymore” and Drews is “bringing it back to life”. He’s a fifth generation sausage maker that has honed his craft for 35 years. He’s from a family of German butchers and has settled in Canada for 21 years. Before starting his business, he was the production manager at Grimms and later, the plant manager at Fletcher’s. One day, he decided he’s finally had enough. It’s “time to do something good, something fun, go back to the roots”, he explained. The crazy story behind the location. D Original Sausage has been in this Main Street space for just over one year. The previous owner was a semi-retired elderly man that wanted to make some side money with sausage making. Sadly, he developed Alzheimer’s disease and lost much of his memory. Every morning, he drove into work, sat down, and didn’t know what to do. He only allowed his son to enter the workshop as he became increasingly “wondrous”. As a result, he ordered and discarded thousands of dollars worth of meats, casings, and spices. When Drews found out about the situation through the son, he offered a hand. When everything that could possibly go wrong, does. Every single fuse in the space blew in the first half-year of operation. Drews and his partner worked very long hours to bring the workshop up to specs. When everything was finally up and running, the old pipes that accumulated dust over the years ignited. Drews called his distributor to inform everyone that there was “no more product”. The partners hurried to fix everything up again. It all seemed to pay off when they signed a big contract with a business that immediately dropped all their other meat suppliers. They thought they were set. That’s when the epic Main Street fire struck. Their building fortunately did not burn to the ground like the neighbouring ones did but their workshop still suffered tremendous damage. Their power was disconnected for six weeks and held back any renovation plans. “What a nightmare… and this was during Christmas,” Drews recalls. Drews and his partner walked us through the smoke room, curing room, and the walk-in fridge. After the tour, they pulled out even more meats for us to sample and a generous amount to take home. I was overjoyed. When I asked him where my readers can purchase his product, he replied, “I’m not sure. I’ll have to ask my distributor… but everything will be on the website soon”. At the moment, his website is still a domain placeholder but he managed to open a twitter account. I hope that their plunge into the murky waters of social media marketing will help their small business excel. Thanks Drews and his silent partner for their generosity and sharing their remarkable story. Very cool. Thanks for sharing, I will be sure to check it out. what a great story. Can’t wait to find their product available in the Okanagan. Remarkable story indeed! I’m assuming it’s cash only?